When it’s time to build your outdoor living space, look beyond the standard bricks and wood and consider using luxurious marble. Vanilla Oro tiles can be used to build a stunning terrace that you’ll love now and for years to come. If you’re planning on using marble for the flooring, remember that this is only the first step. 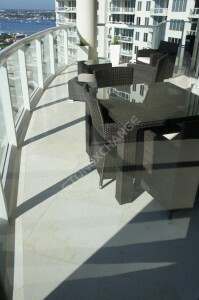 There are several other creative ways that you can incorporate marble into the terrace to make it more attractive and enjoyable. Every great patio needs some kind of outdoor countertop to serve as a workstation. Whether you build a bar or have a simple table, you can make this space more luxurious by covering it in beautiful white marble. The marble can withstand regular sun and water exposure better than wood and even ceramic tile. It can last for years to come, and it will look great with minimal care. If your counter is against a wall, you can carry the tile up along the backsplash for an area that’s easy to clean and very attractive. The light will reflect off the white tiles to make this space look larger than it really is, so you can open up some floor area by going with a slightly smaller counter. A growing trend is to use benches in lieu of railings around the patio. You can even turn these benches into enclosed storage areas for cushions and other supplies. However, people sometimes feel that they’re a little bland and dull. If you have solid vertical surfaces, consider dressing the benches up with Vanilla Oro tiles. You’ll make them feel more luxurious and ensure that the entire space looks amazing. This is particularly effective if you’re working with bright colors in the upholstery and accents. You’ll make the area feel larger and more spacious than it would if you used dark tones or wood along the supports. When the benches are so welcoming and inviting, your guests will be more than happy to relax on the perimeter benches. You may not want to cover the entire patio in white if it has regular sun exposure, but you can still work this brilliant shade into the overall design. Use Vanilla Oro tiles to take your basic floor covering to a higher level. You can work it into an elegant design or border to add interest without overwhelming the space. Draw out your pattern on paper ahead of time to be sure that you like it, or work with an area artist to create a stunning design that suits your style perfectly. If your patio will have different seating areas, you can use the white tiles to highlight certain areas or mark the boundaries between spaces. In addition to creating clearly defined spaces, you may also be able to give the area a more elegant feel that’s sure to impress your guests. If your terrace is high above the ground, then you may have a low wall that serves as a solid railing and barrier. The horizontal covering on these walls take constant abuse from standing water and the sun. Over time, wood or other coverings may wear down and subject the walls to water intrusion, but you can prevent this structural damage by topping it with beautiful Vanilla Oro tiles. The tiles are waterproof and can easily withstand years of direct sun exposure. You’ll appreciate the luxurious look, and the flat surface may also serve as a place for guests to set down drinks and plates when you entertain. If your terrace features a pool, consider using this brilliant white tile along the pool’s edge. If the main deck features a contrasting color, then the white tile will help set off the edge of the pool for safety. When people can easily see where the deck ends, they’re less likely to accidentally fall into the water. Some people also choose to use this beautiful marble as the pool coving. Another elegant option is to use a raised edge around the pool and cover that surface in marble. 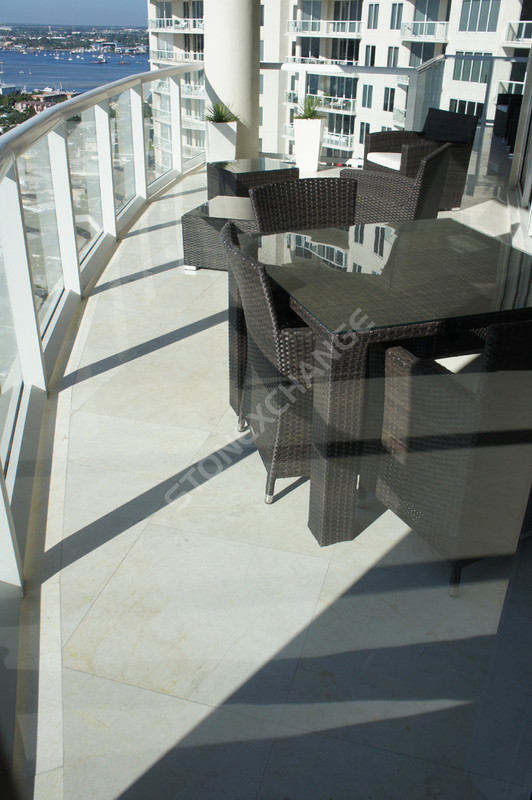 You’ll have a smooth seating area along the pool, and it will give the terrace an impressive look that you’ll love. The stairs that lead into the house or out to the yard don’t have to be built from plain wood. You can use marble on the treads and the risers to turn the steps into an impressive accent or focal point. Consider using contrasting colors to help tie the overall design scheme together. Use tumbled finishes to give the stairs a little more traction and help prevent accidents. A benefit of using white on the stairs is that you’ll also make them more visible and a bit safer. Another growing trend is to mix tile and grass. You’ll need a stable support system to prevent the marble from cracking, but you can leave a larger gap between tiles and then plant grass where grout would normally be. This is a beautiful treatment for urban terraces where you may want more natural elements, and you may love the added texture of soft, green grass. Whether you’re using white Vanilla Oro marbles as an accent point in the outdoor kitchen or want to cover the entire space or a north-facing terrace, you can count on Nalboor for attractive rates and excellent customer service. We take steps to maintain low overhead, and we pass those savings on to our customers. We have wholesale pricing that you’ll appreciate, and we offer high-quality tiles that you’ll love. Orders are filled quickly, and we work with nationwide shippers so that you can enjoy prompt delivery. We offer a few different finishes, so you can choose to have the tiles tumbled, honed or polished based on your particular needs. Contact us today to place your order or with any questions you may have.